A wealthy spinster and her cockney maid take a beautiful Connecticut summer home in 1931. 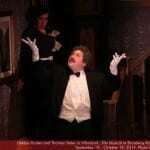 When they arrive, all the help has quit, except for a very odd butler who warns that something strange is going on. 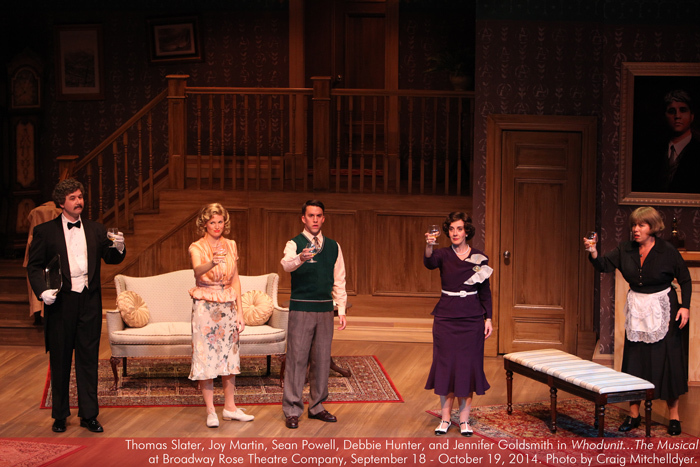 They are soon joined by the spinster’s niece who’s brought a friend… a “friend” who turns out to be a young man! Heavens! After a night of attempted break-ins, the sound of gun shots, and the discovery of a dead body – or two – the detective arrives and things get REALLY strange! 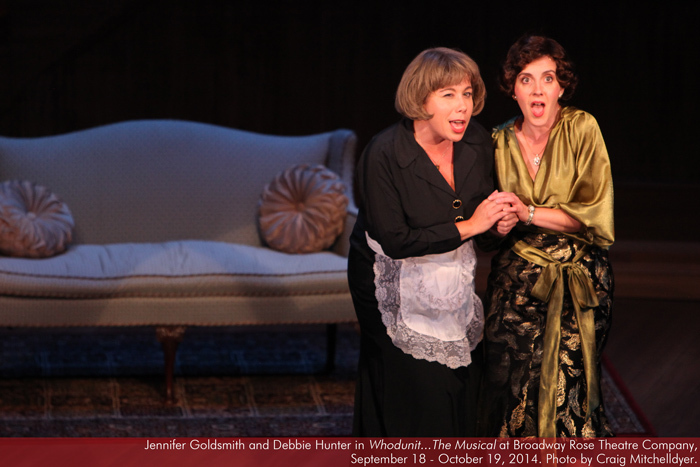 Whodunit is a tuneful, riotous romp that’s part mystery, part drawing room farce, and all musical comedy. 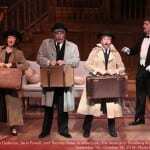 Mike Dederian (Mr. Jarvis) last clinked mugs at Broadway Rose as Alfie’s pal Jamie in My Fair Lady. He has also performed locally in South Pacific (Emile) and Curtains (Oscar) with Lakewood Theatre Company; in Goldilocks (Max) and The Baker’s Wife (M. le Marquis) with Lakewood’s Lost Treasures Collection; and with Portland Actors Ensemble in The Tempest (Prospero) and Henry IV (Douglas). 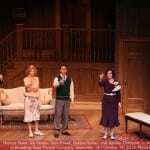 An internationally produced playwright and graduate of Harvey Mudd College, Mike hails from the San Francisco Bay Area, where his favorite roles included The Actor (Enter the Guardsman), Robin Oakapple (Ruddygore), Dexter (High Society), Zach (A Chorus Line), Arthur (Camelot), and Tateh (Ragtime), for which he won the regional Shellie Award. Mike lives in Wilsonville with his wife Margo (also seen at Broadway Rose) and daughter Rosaline (perhaps someday!). Debbie Hunter (Carrie Innes) is absolutely delighted to return to Broadway Rose, where she last appeared in the 2004 production of The Gifts of The Magi. You also may have seen her in the first productions of G.I. Jukebox/G.I. Holiday Jukebox, as well as A Christmas Survival Guide and Some Enchanted Evening. 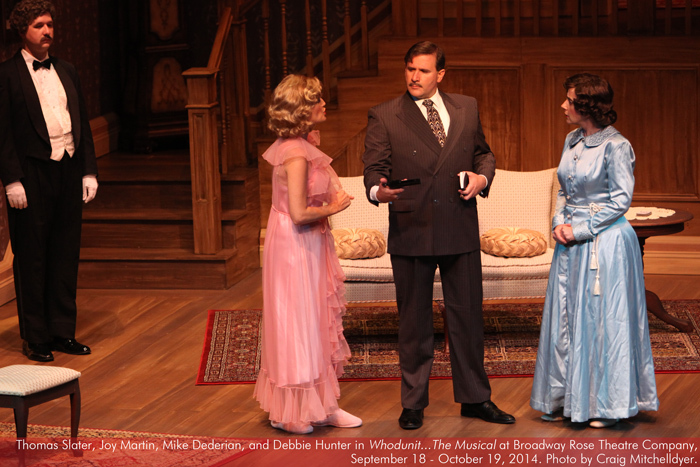 Debbie has appeared in a variety of roles, both musical and non-musical at several other area and regional theaters. Some of her favorite roles include Eliza Doolittle in My Fair Lady (Portland Center Stage (u/s), Dallas Theater Center, and Lakewood Theater), Maria in The Sound of Music, Yum Yum in The Mikado, and Laurey in Oklahoma (Musical Theater Company), Fiona in Brigadoon (Lakewood Theater), Laura in The Goblin Market (Stark Raving Theater), Rose in Ruddigore, Tessa in The Gondoliers, and Charlotte in A Little Night Music (Mock’s Crest) for which she was honored with a 2010 Drammy Award. She is a founding member of Quintessence Language and Imagination Theater, where she has appeared as Anne Elliott in Persuasion, Elizabeth Bennet in Pride and Prejudice, Beatrice in Much Ado About Nothing, Ophelia in Hamlet, Imogen in Cymbeline, Celia in As You Like It, Malcolm in Macbeth and Katherine in Henry V. Debbie has entertained aboard several riverboats, performed with the Oregon Symphony, and was chosen to participate in the International Cabaret Conference at Yale University. She also released a cd of jazz standards called Love is in the Air. Debbie received her B.F.A. in Music Theater from Illinois Wesleyan University. 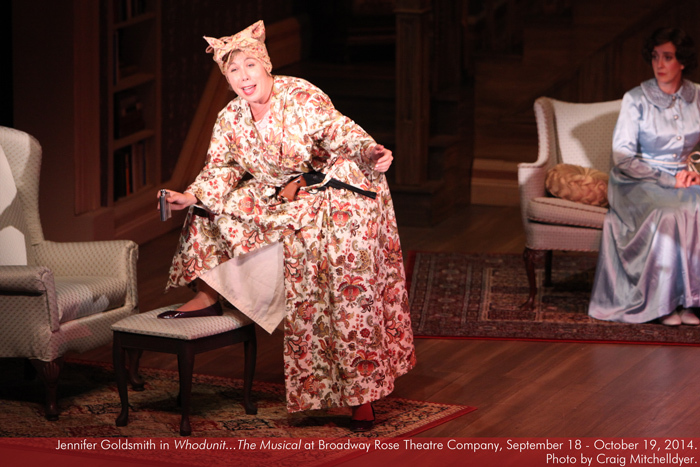 Jennifer Goldsmith (Liddy Allen) is excited for the opportunity to come back to Broadway Rose after a 21-year hiatus where she was honored to play in Godspell and 100 Year Revue. While on vacation from Broadway Rose, some of her other favorite roles include Fanny Brice in Funny Girl, Sally Bowles in Cabaret, Lottie in Enchanted April, Georgie in Full Monty, Wendy Wasserstein in Shiksa Goddess…, Judas Iscariot in Jesus Christ Superstar, Natasha in Three Sisters, Mrs. Walker in Tommy, Baker’s Wife in Into the Woods and her Drammy Award-winning portrayals of Franca Nacarelli in Portland Playhouse’s acclaimed Light in the Piazza, Trina in Falsettos and Babs Streisand, Ethel Merman, Edith Piaf, et al. in Forbidden Broadway for triangle productions! She has toured nationally with the Young People’s Theatre Project as well as singing up and down the Mississippi River with the Delta Queen Steamboat Company. When not on stage, she is back stage working as the associate development director for Portland Center Stage. Joy Martin (Sally Innes) is so excited to be performing with Broadway Rose! Most recently she has been seen in Portland as Amneris in Aida with Stumptown Stages, and as a Sweatheart in Dreamgirls with Portland Center Stage. A few of her favorite roles include Evelyn Nesbit in Ragtime and Anne in A Little Night Music with Coeur d’ Alene Summer Theatre, and Lily in The Secret Garden with Lakewood Theatre. Outside of theater she enjoys rocking out as a singer and dancer in the band Con Bro Chill! She graduated with a B.A. 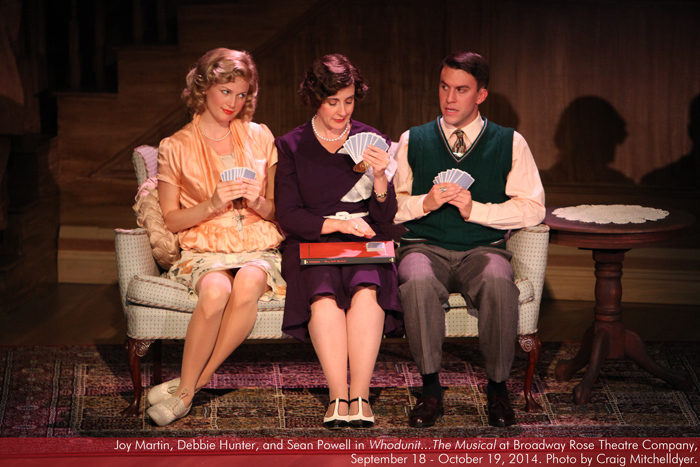 in Theater/Musical Theater from Marymount Manhattan College in New York City. 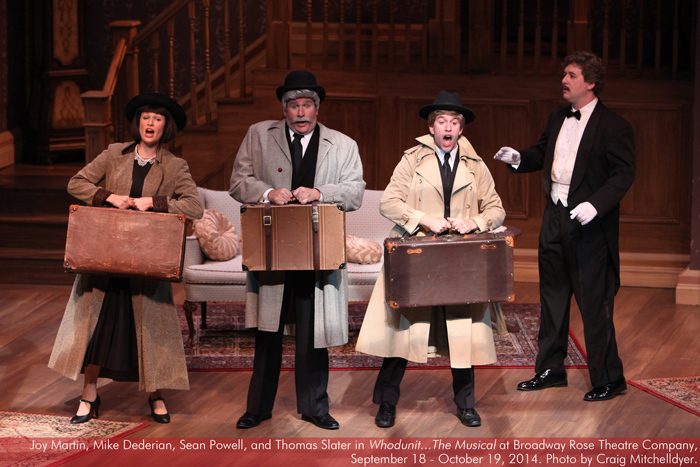 Sean Powell (Jack Bailey) is so pleased to be part of Whodunit…the Musical here at Broadway Rose! “Thanks to Annie, Mont Chris, Erin, and the entire Broadway Rose family.” Previously he was seen as Smudge in Plaid Tidings, Gangster #1 in Drowsy Chaperone, and Asher in Joseph and the Amazing Technicolor Dreamcoat. Other credits include Allen in Bobrauschenbergamerica (Third Rail Mentorship), Michael in La Cage Aux Folles (Lakewood), Mercutio in Shakespeare’s R&J (Bag&Baggage Productions), and Georg in Spring Awakening (Live On Stage). Sean received his B.F.A. in Theatre from New York University. Love to friends, family, and Brandon. 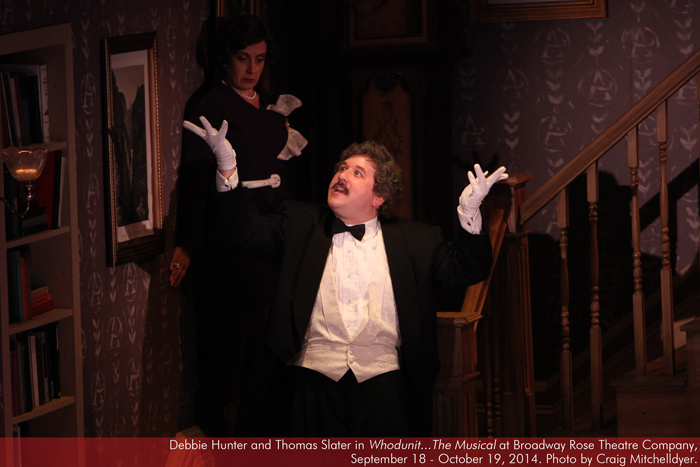 Thomas Slater (Thomas) is thrilled to return to Broadway Rose! Most recently Thomas performed here in The Music Man as Jacey Squires and in Lakewood’s Show Boat earlier this year. Other Broadway Rose credits include Zoltan Karpathy in My Fair Lady and Underling in The Drowsy Chaperone. A graduate of Western Oregon University with a degree in Theater Arts, Thomas’s hobbies include computers, video games… anything to do with technology, really. He thanks his friends and family for all their support, and he thanks you, dear reader, for being a patron of the arts! Director Annie Kaiser stages the show energetically, with the actors covering every inch of the stage during the upbeat piano tunes. In a pristine suit and white gloves, Thomas Slater is hilarious as the butler, delivering every line with a sarcastic drawl. 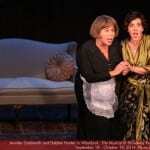 But it’s Liddy’s infectious cackle that steals the show...Read more. 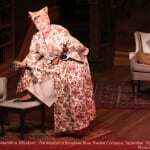 The standout, however, is Jennifer Goldsmith as Liddy, the maid. 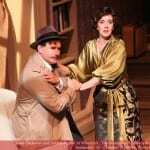 She’s not asked to be serious at any point in the proceedings, and she’s lobbing wisecracks at us from the moment she enters the play… turning even the most innocuous of lines into a comic masterpiece, and when she finally gets a big number of her own she sells it a hundred percent…Read more. 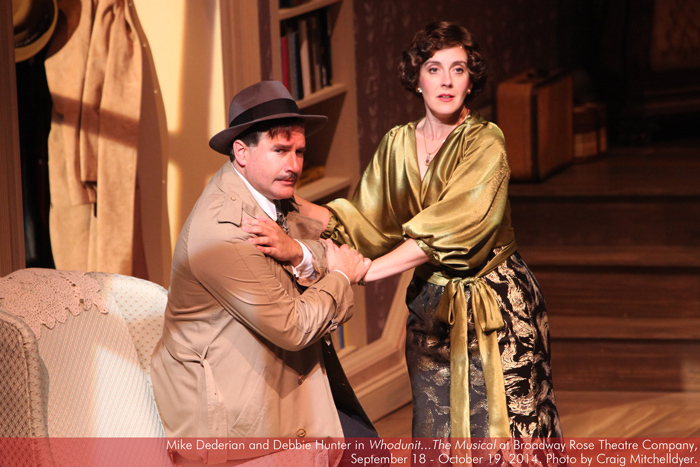 …a creampuff of a play that hilariously sends up Agatha Christie and those of her ilk, plus offers delectable songs and a few kick-up-your-heels dance numbers that add much to the total effect. Director Annie Kaiser has kept the pace bright, and we found ourselves guessing until the end who actually done did it…Read more. 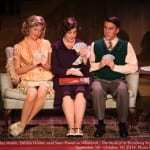 Depending on the time of year, Broadway Rose is either a big company producing lavish Broadway musicals or a small, intimate company offering quirky and often unknown gems. 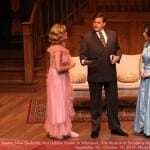 This season’s latest gem, Whodunit… The Musical, is a real treasure, both as a musical and as a comedy…Read more. Kaiser has done well with keeping the story moving and selecting a very good cast. Hubbard, as always, gives his best. And Shannon is a choreographer to be watched, fresh from her terrific job with Pixie Dust…Read more. It’s always nice to find a show that you can recommend to everybody, a show so genuinely fun that it has something to please every taste…Read more. In reality, Hunter has a day job as an administrative assistant at Legacy Health, a husband and an impressive resume of acting credits with the major theater companies in the Portland area, including Broadway Rose, where she last appeared in the 2004 production of “The Gifts of the Magi.” Read more.